A tragic footnote to the carnage of July 3 occurred in the farm fields and woods south of Big Round Top. 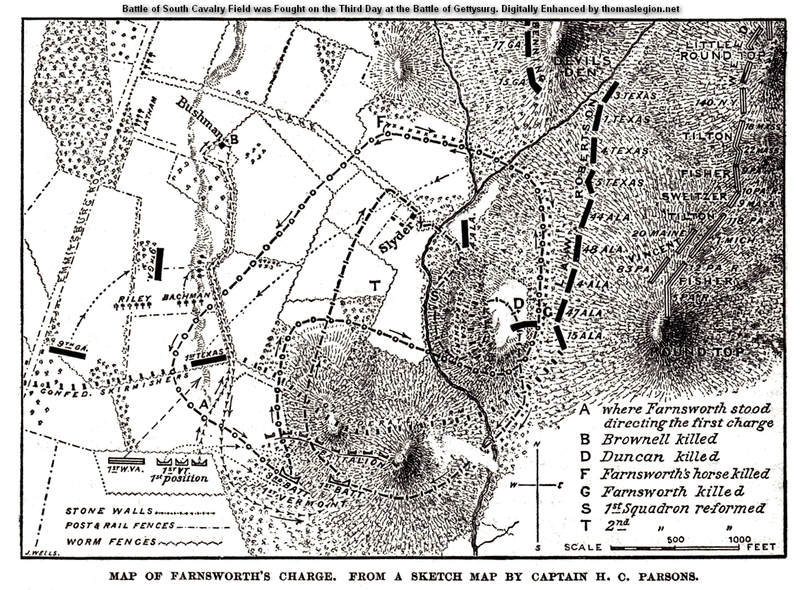 Elon J. Farnsworth, a newly appointed brigadier general, led his brigade of Union troops to Gettysburg and into his first and last battle. Farnsworth was born in Green Oak, Livingston County, Michigan, on July 30, 1837, and his family moved to Illinois in 1854. He graduated from the University of Michigan in 1858. During the "Mormon Expedition" in 1858 in the Utah Territory, he served as a civilian foragemaster on the staff of General Albert Sidney Johnston. He also worked as a buffalo hunter and scout in the Colorado Territory. 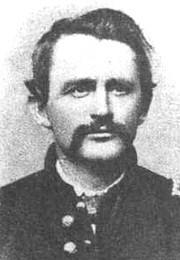 At the outbreak of the Civil War, Farnsworth was appointed a first lieutenant in the 8th Illinois Cavalry and he served with distinction; the regiment was commanded by his uncle, John F. Farnsworth. He was promoted to captain on December 25, 1861, and was appointed Assistant Chief Quartermaster of the IV Corps. In the Battle of Chancellorsville and early stages of the Gettysburg Campaign in 1863, he served faithfully as aide-de-camp to Brig. Gen. Alfred Pleasonton. On June 29, 1863, just days before the Battle of Gettysburg, he was promoted to brigadier general of volunteers by Pleasonton. He was appointed as commander of 1st Brigade, 3rd Division, Cavalry Corps, Army of the Potomac. "It is remarkable that the most deliberate and desperate cavalry charge made during the Civil War passed so nearly unnoticed that the attention of the country was first drawn to it by reports of the enemy. The charge was directly ordered by General Meade and immediately after it was made he sent a congratulatory dispatch, and yet when the report went up that Farnsworth was killed and the regiment that he led all but annihilated, this order was withheld from the Official Report. The friends of Farnsworth attacked Kilpatrick for having ordered a wanton waste of life and he remained silent. If the charge had been on any other part of the field, or at an earlier hour of the day, it would have commanded wide attention. As it was, it was witnessed only by the enemy and by the few men at the batteries. "After the repulse of Pickett, Meade's attention was drawn to an apparent movement of the enemy's troops towards the right. His left wing was peculiarly unprotected. Law's brigade was firmly lodged on the side of Round Top, and the valley to which Longstreet's eye turned so eagerly was open. 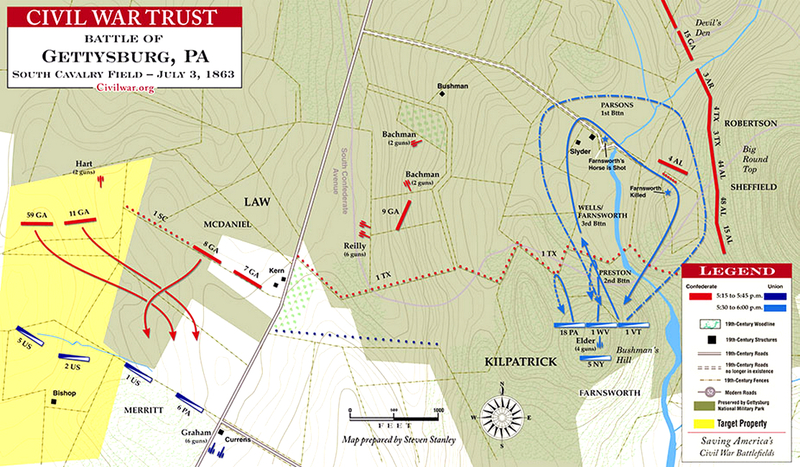 An order reached Kilpatrick to hurl his cavalry on the rear of Law's brigade and create so strong a diversion that Lee's plan would be disclosed. At the moment of receiving this order Kilpatrick's forces were widely scattered. Custer was fighting with Gregg, the Reserve was with Merritt, the 5th New York was on the skirmish line, nothing was within striking distance but the 1st West Virginia and the 1st Vermont. The 1st West Virginia was sent across the open fields and against the 1st Texas Infantry and was repulsed after a second charge with great loss. The first and third battalions of the 1st Vermont were sent under cover of all the guns that could be brought into position over fences, through timber and up rocky sides of Round Top directly in rear of Law's brigade. They received the direct enfilading fire of three regiments, and of a battery of artillery. They drew two regiments out of line and held them in new positions, breaking the Confederate front and exposing it to an infantry charge if one had been immediately ordered. So bold was their assault that the Confederates received it as the advance of a grand attack, and finding themselves exposed to infantry in front and cavalry in the rear, were uncertain of their position. "The whole number who rode in the charge was about three hundred. Their casualties were sixty-five. Their prisoners were one hundred and twenty. They rode within the Confederate line nearly two miles and the regiment, instead of being annihilated, is reported as having taken part in subsequent engagements. "Farnsworth rose in his stirrups and leaned forward, with his sabre half-drawn; he looked magnificent in his passion and cried: 'Take that back!' Kilpatrick rose defiantly, but repentingly said: 'I did not mean it; forget it.' For a moment, nothing was said. (Then) Farnsworth spoke: 'General, if you order the charge I will lead it, but you must take the awful responsibility.' I did not hear the low conversation that followed, but as Farnsworth turned away, he said: 'I will obey your order.' They shook hands and parted in silence. I recall the two young generals at that moment in the shadow of the oaks and against the sunlight, Kilpatrick with his fine gestures, his blond beard, his soft hat turned up jauntily and his face lighted with the joy that always came into it when the charge was sounded. Farnsworth- heavy browed, stern and pale but riding with conscious strength and consecration… two men opposite in every line of character, but both born to desperate daring. "The direction of our guns was changed… (and) the artillery duel began. A shell shrieked down the line of my front company a few feet above their heads, covering them with leaves and branches. We rode out in columns of fours with drawn sabres. After giving the order to me, General Farnsworth took his place at the head of the 3rd Battalion. "As the 1st Battalion rode through the line of our dismounted skirmishers who were falling back, they cried to us to halt. As we passed out from the cover of the woods, the 1st West Virginia were falling back in disorder on our left. A frantic horse with one leg torn off by a cannon ball rushed towards us for protection. We rode rapidly to the left and then to the right, across a depression at the left of a stone wall. The sun was blinding and Captain (Oliver T.) Cushman, who rode at my right, shaded his eyes and cried: 'An ambuscade!' We were immediately upon the enemy, and the deadly (Confederate) volley was fired, but it passed over our heads. It was the most concentrated volley I ever heard. Taken by surprise, they had shot over us. With the head of the column we cleared the fence at the right and formed under cover of a hill. The 3rd Battalion under Major (William) Wells, a young officer who bore a charmed life and was destined to pass through many daring encounters… moved out in splendid form to the left of the 1st Battalion, and swept in a great circle to the right around the front of the hill and across our path, then guiding to the left across the valley and up the side of the hill at the base of Round Top. Upon this hill was a field enclosed with heavy stone walls. They charged along the wall and between it and the mountain directly in the rear of several Confederate regiments in position and between them and the 4th Alabama. It was a swift… charge over rocks, through timber, under close enfilading fire. The rush was the war of a hurricane. The direction towards Devil's Den. At the foot of the declivity the column turned left, rode close to a battery, receiving the fire of its support, and swept across the open field and upon the rear of the Texas skirmish line. 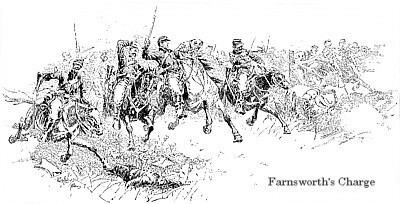 Farnsworth's horse had fallen; a trooper sprang from the saddle, gave the General his horse and escaped on foot. Captain Cushman and a few others with Farnsworth turned back. The 1st Battalion was again in motion. The enemy's sharpshooters appeared in the rocks above us and opened fire. We rode obliquely up the hill in the direction of Wells, then wheeling to the left between the picket line and the wall. From this point, part of my men turned back with prisoners. The head of the column leapt the wall, into the open field. 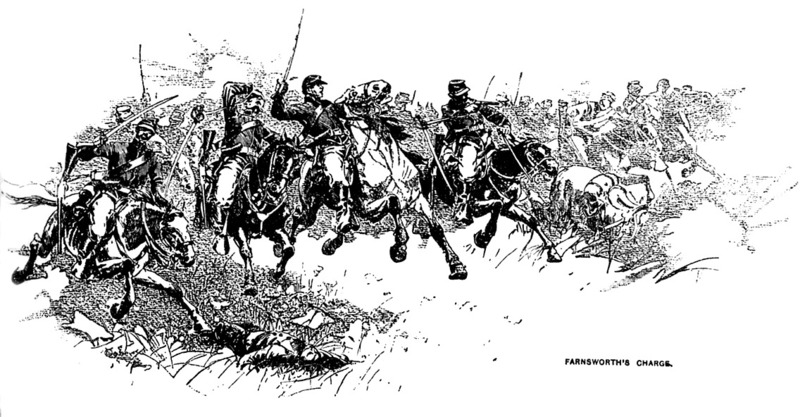 Farnsworth, seeing the horsemen, raised his sabre and charged as if with an army. At almost the same moment his followers and what remained of the 1st Battalion cut their way through the 15th Alabama, which was wheeling into position at a run and offered little resistance. We charged in the same direction but on opposite sides of the wall that parallels Round Top and within two hundred paces of each other. "Sergeant (George H.) Duncan, a black-eyed, red-cheeked boy, splendidly mounted, standing in his stirrups, flew past me with his sabre raised and shouted: 'Captain, I'm with you!' and threw up his left hand and fell. My horse recoiled over his dead body, my men swept past and I was a moment alone on the field. The enemy ran up crying 'Surrender!' as if they did not want to shoot me, but as I raised my sabre a gun was planted against my breast and fired; my horse was struck at the same moment and broke frantically through the men, over the wall and down the hill. Corporal Waller overtook me from the left and riding close supported me on my horse. As we rode on he told me how Farnsworth and Cushman fell together. Sources: National Archives; Library of Congress; Official Records of the Union and Confederate Armies; National Park Service; Gettysburg National Military Park; Map courtesy Civil War Trust; "Gettysburg South Cavalry Field" by Map by Hal Jespersen,posix.com/CW. Licensed under CC BY 3.0 via Commons. Recommended Reading: Struggle for the Round Tops: Law's Alabama Brigade at the Battle of Gettysburg. Description: Morris M. Penny and J. Gary Laine have produced a compelling story of Law's Alabama Brigade's attempt to wrest the Round Tops from Federal hands. In July 1863, Evander McIver Law, age 26, was one of Robert E. Lee's most promising generals. His brigade of Alabamians shared the Army of Northern Virginia's sense of invincibility. After a grueling 25-mile march to the battlefield, Law's men made a valiant three-hour effort to gain control of the high ground on the Federal right. Continued below. Struggle for the Round Tops describes the vicious fighting around Devil's Den, in the Devil's Kitchen, and the heartbreaking repulse from Little Round Top. Law's Alabamians participated in the defense of the Confederate right on July 3 and delighted in unhorsing a number of Federal troopers in Farnsworth's Charge. Two days after it arrived, the brigade retired from the field with the realization that the Federals had matched their own fighting ability. Law himself departed with the seeds of discord planted that would ultimately culminate in a devastating feud between himself and Longstreet. Much has been written about the conduct of the Confederate commanders on July 2. Some historians have suggested that Law deliberately disobeyed an order to launch his assault up the Emmitsburg Road. The authors examine the implications of Lee's orders and offer new insight into Hood's and Law's perspective of the situation and the leeway Hood assumed as a division commander.